The 71st Annual Golden Globe awards held in LA last night saw the red carpet awash with a mixture of colourful gowns, metallic hues, red lips and statement jewellery. These are my top ten looks from the evening. Caitlin Fitzgerald went straight on my best dressed list in this vintage style powder blue Emilia Wickstead gown with a mullet hem. 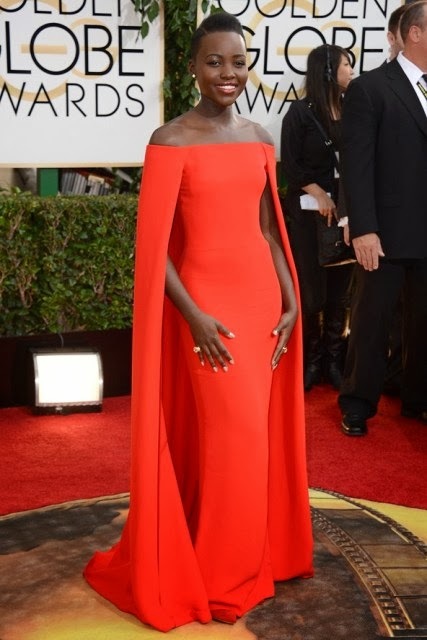 Relatively new to red carpet scene Lupita Nyong'o stood out in a red off the shoulder cape dress by Ralph Lauren. Anything but a standard LBD, Cate Blanchett wowed in an Armani Prive lace couture gown. She accessorised with diamond Chopard earrings from their Green Carpet Collection. Not only was she a winner in the fashion stakes, she took home the award for 'Best Actress' in 'Blue Jasmine.' Also opting for black lace, Leslie Mann stepped out in this striking peplum dress from Dolce & Gabbana. Michelle Dockery and Zooey Deschanel both chose Oscar de la Renta to create a fairytale look for the red carpet. Michelle paired her pretty jewelled gown with a simple red lip. I loved Zooey's embellished cropped top styled with a full tulle skirt and studded Oscar de la Renta pumps. Renowned for her love of nail art she opted for a daisy manicure for the awards. The Downton Abbey ladies certainly know how to party in style with Laura Carmichael also looking effortlessly elegant on the red carpet in a monochrome Viktor & Rolf gown with a sweetheart neckline and a simple silhouette. Margot Robbie wore a plunging white Gucci dress with a thigh high split which revealed emerald green Christian Louboutin's matching her emerald and crystal lined gown. Helen Mirren looked stunning in a bespoke draped gown from one of my favourite British designers, Jenny Packham. I loved the beaded detailing across the emerald fabric. To compliment the dress she wore emerald and diamond earrings. The metallic trend was popular on the night. Naomi Watts stood out in this metallic Tom Ford gown with a statement gold chain necklace. What was your favourite trend from the red carpet? The Globes brought some stunning looks indeed.